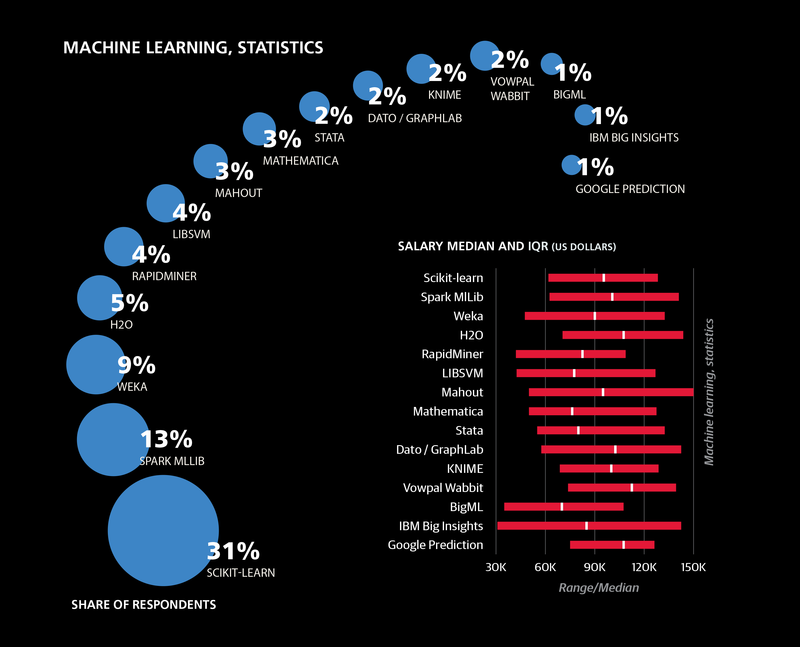 This is the full ebook "2016 Data Science Salary Survey," also available for download. 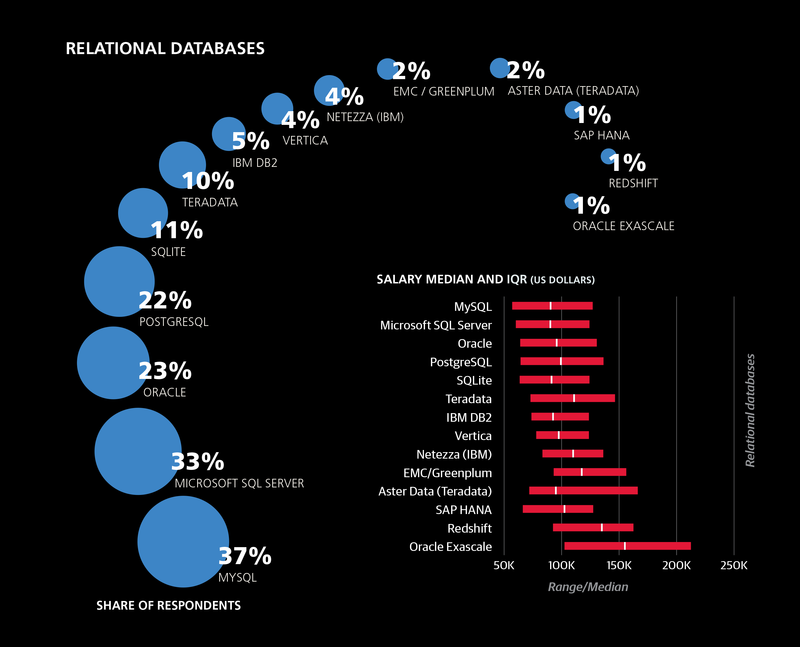 IN THIS FOURTH EDITION of the O’Reilly Data Science Salary Survey, we’ve analyzed input from 983 respondents working in the data space, across a variety of industries— representing 45 countries and 45 US states. 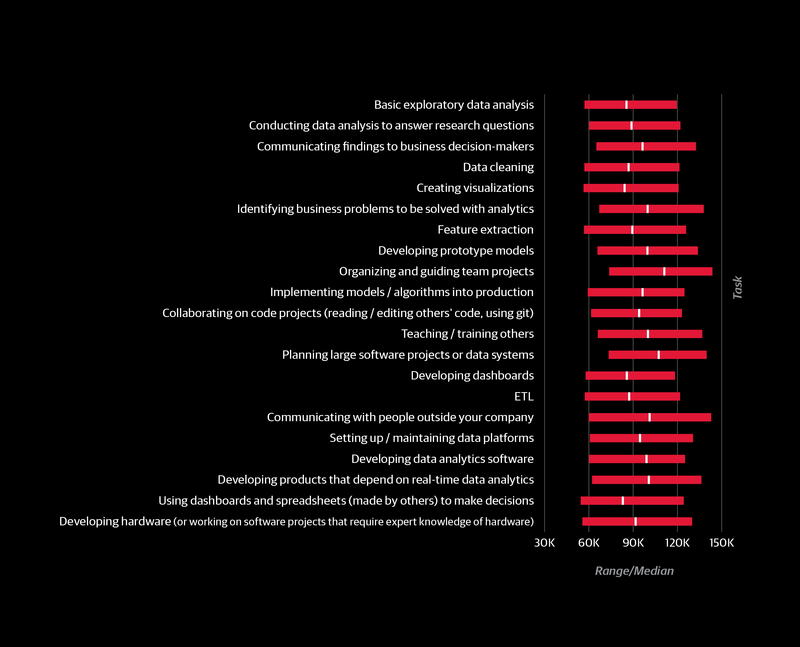 Through the results of our 64-question survey, we’ve explored which tools data scientists, analysts, and engineers use, which tasks they engage in, and of course—how much they make. Those who attend more meetings, earn more. Women make less than men, for doing the same thing. Country and US state GDP serves as a decent proxy for geographic salary variation (not as a direct estimate, but as an additional input for a model). 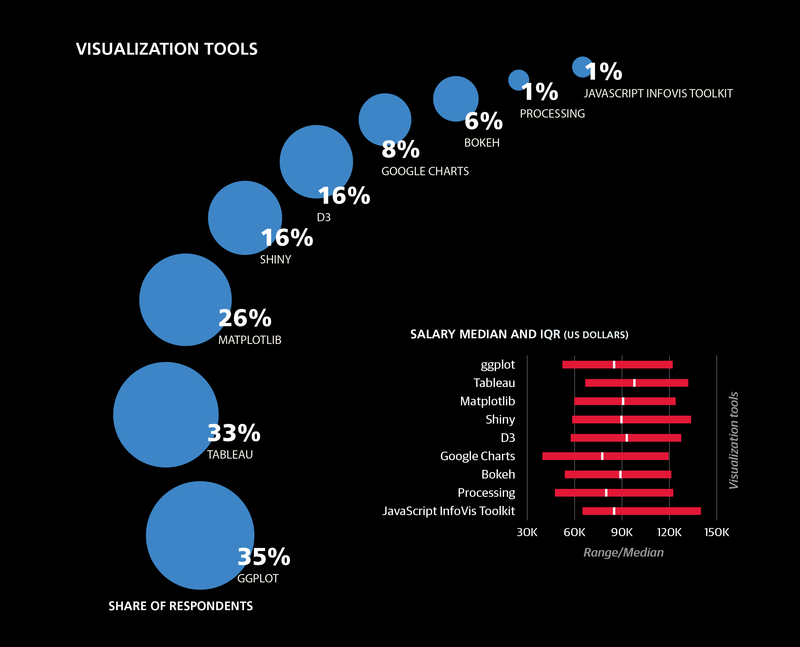 The most salient division between tool and tasks usage is between those who mostly use Excel, SQL, and a small number of closed source tools—and those who use more open source tools and spend more time coding. 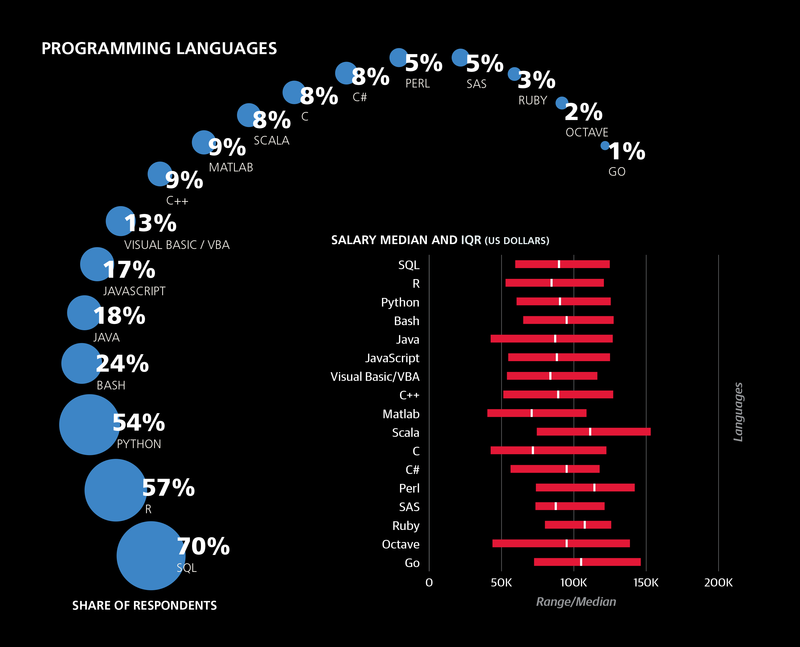 R is used across this division: even people who don’t code much or use many open source tools, use R.
A secondary division emerges among the coding half— separating a younger, Python-heavy data scientist/analyst group, from a more experienced data scientist/engineer cohort that tends to use a high number of tools and earns the highest salaries. To see our complete model and input your own metrics to predict salary, see Appendix B: The Regression Model (but beware—there’s a transformation involved: don’t forget to square the result!). 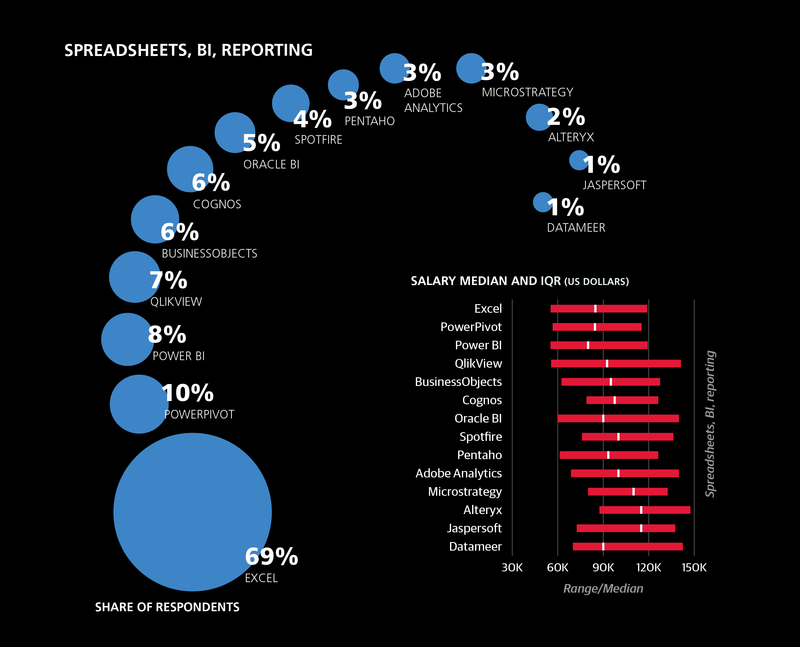 FOR THE FOURTH YEAR RUNNING, we at O’Reilly Media have collected survey data from data scientists, engineers, and others in the data space, about their skills, tools, and salary. 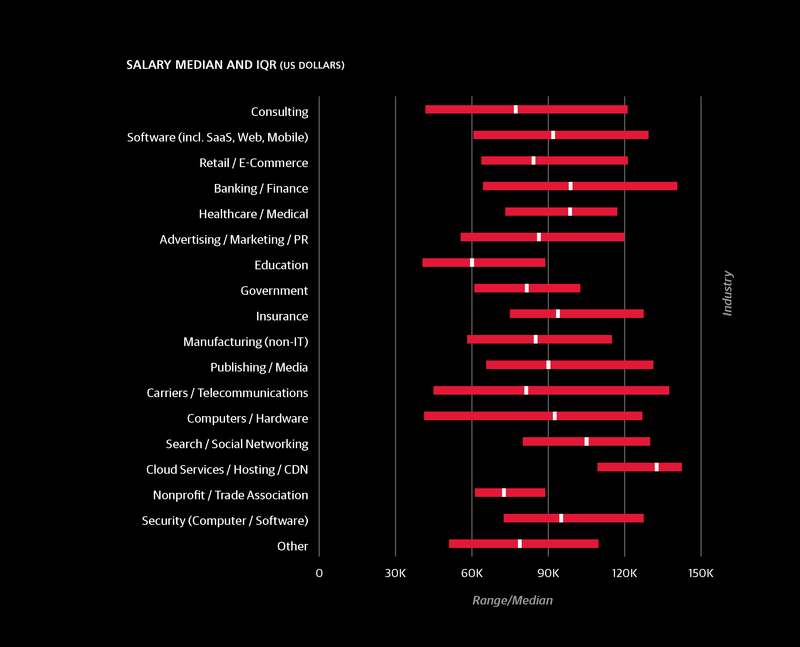 Across our four years of data, many key trends are more or less constant: median salaries, top tools, and correlations among tool usage. For this year’s analysis, we collected responses from September 2015 to June 2016, from 983 data professionals. In this report, we provide some different approaches to the analysis, in particular conducting clustering on the respondents (not just tools). We have also adjusted the linear model for improved accuracy, using a square root transform and publicly available data on geographical variation in economies. 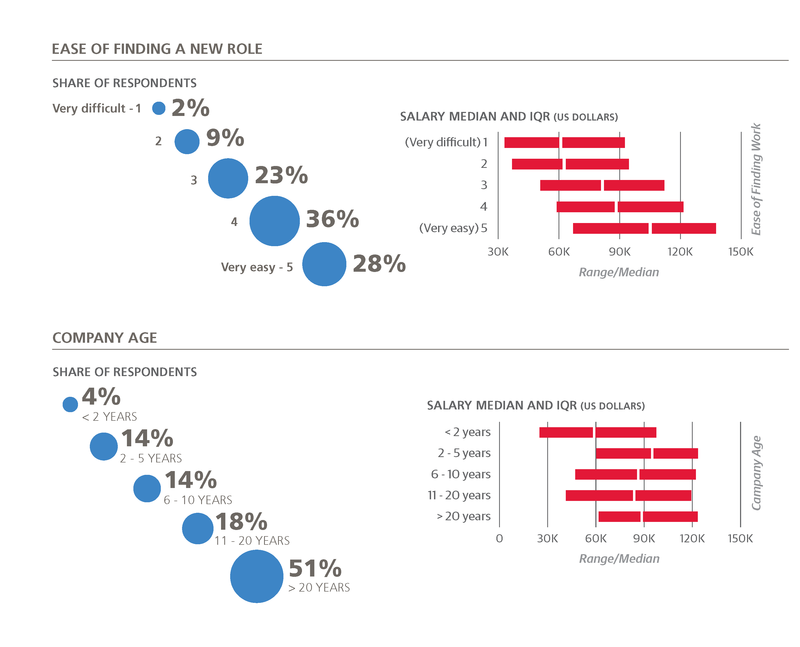 The survey itself also included new questions, most notably about specific data-related tasks and any change in salary. The median base salary of the entire sample was $87K. This figure is slightly lower than in previous years (last year it was $91K), but this discrepancy is fully attributable to shifts in demographics: this year’s sample had a higher share of non-US respondents and respondents aged 30 or younger. Three-fifths of the sample came from the US, and these respondents had a median salary of $106K. 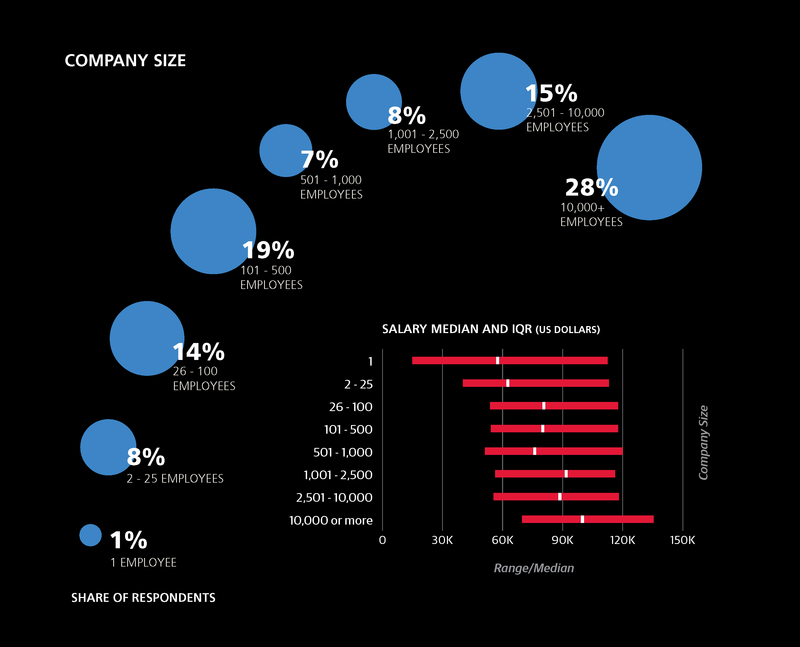 For a number of survey questions, we show graphs of answer shares and the median salaries of respondents who gave particular answers. While median salary is probably the best number to compare how much two groups of people make, it doesn’t say anything about the spread or variation of salaries. In addition to median, we also show the interquartile range (IQR)—two numbers that delineate salaries of the middle 50%. This range is not a confidence interval, nor is it based on standard deviations. 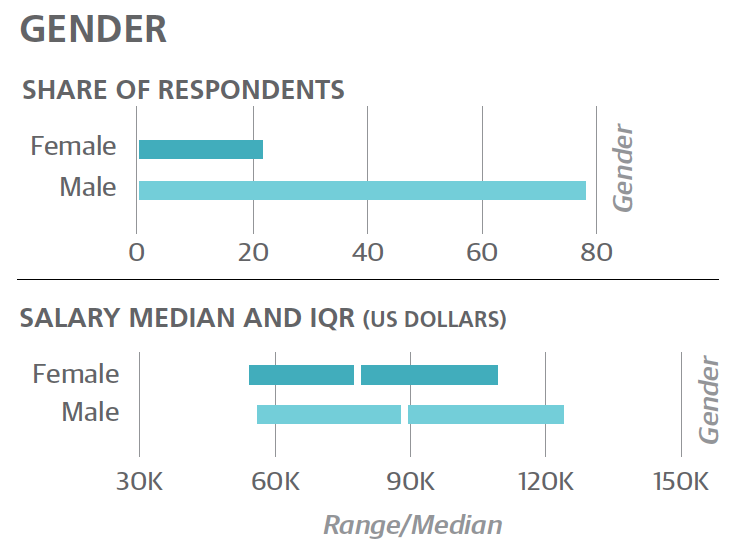 As an example, the IQR for US respondents was $80K to $138K, meaning one quarter of US respondents had salaries lower than $80K and one quarter had salaries higher than $138K. Perhaps more illustrative of the value of the IQR is comparing the US Northeast and Midwest: the Northeast has a higher median salary ($105K vs. $98K) but the third quartile cutoffs are $133K for the Northeast and $138K for the Midwest. This indicates that there is generally more variation in Midwest salaries, and that among top earners—salaries might be even higher in the Midwest than in the Northeast. To use the model for you own salary, refer to the full model in Appendix B: The Regression Model, and add up the coefficients that apply to you. Once all of the constants are added, square the result for a final salary estimate (note: the coefficients are not in dollars). The contribution of a particular coefficient to the eventual salary estimate depends on the other coefficients: the higher the salary, the higher the contribution of each coefficient. 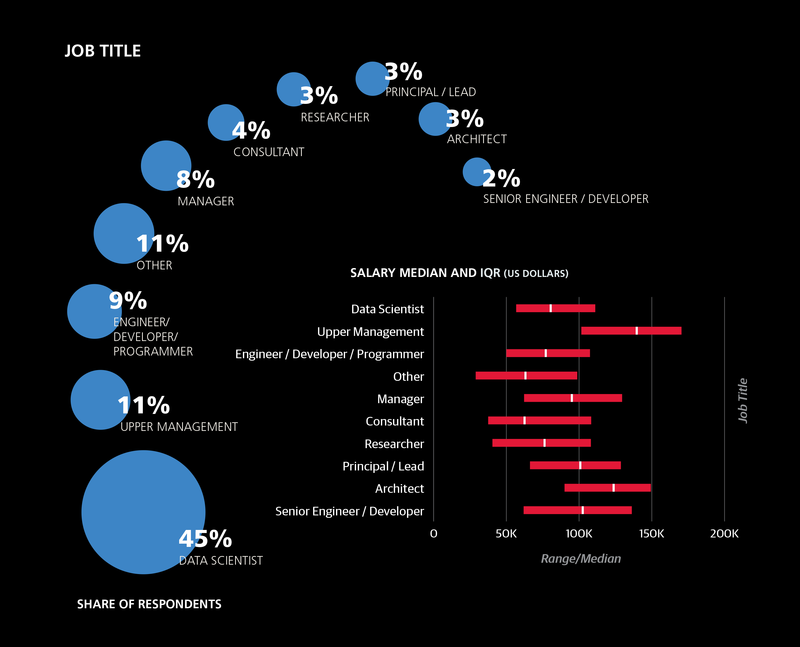 For example, the salary difference between a junior data scientist and a senior architect will be greater in a country with high salaries than somewhere with lower salaries. WE HAVE INCLUDED OUR FULL regression model in Appendix B: The Regression Model. For this year’s report, we have made two important changes to the basic, parsimonious linear model we presented in the 2015 report. We have included: 1) external geographic data (GDP by US state and country), and 2) a square root transformation. The transformation adds one step to the linear model: we add up model coefficients, and then square the result. Both of these changes significantly improve the accuracy in salary estimates. Our model explains about three-quarters of the variance in the sample salaries (with an R2 of 0.747). 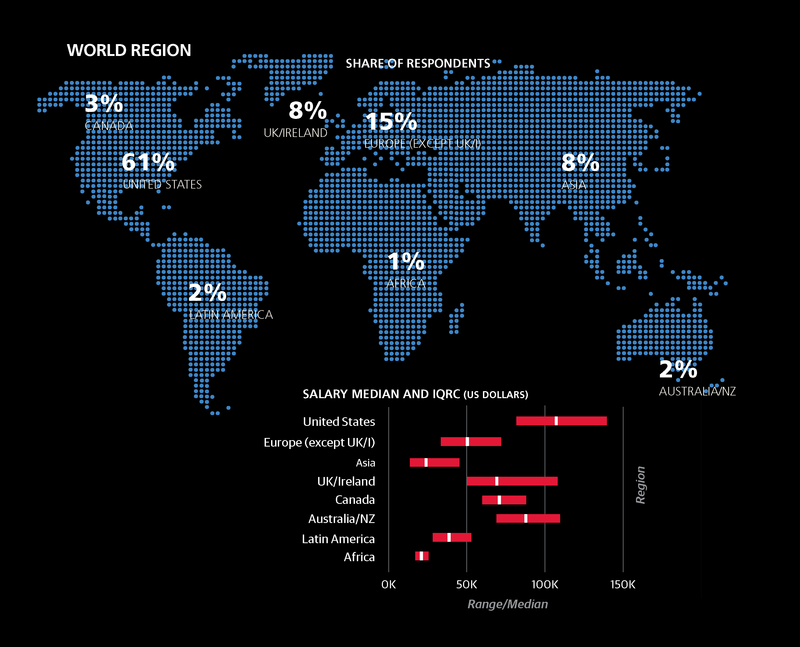 Roughly half of the salary variance is due to geography and experience. Given the important factors that can not be captured in the survey— for example, we don’t measure competence or evaluate the quality of respondents’ work output—it’s not surprising that a large amount of variance is left unexplained. 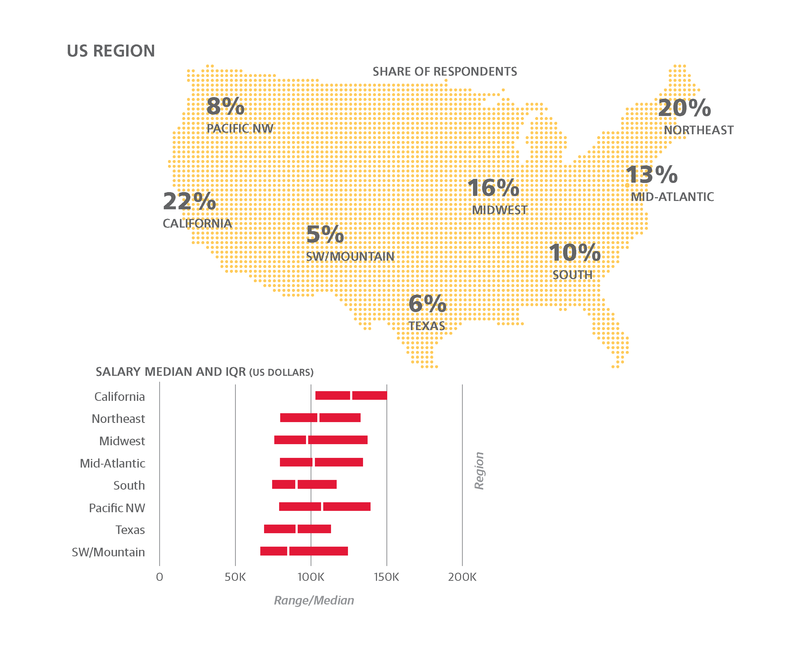 Geography has a huge impact on salary, but is not adequately captured due to sample size. For example, if a country is represented by only one or two respondents, this isn’t enough to justify giving the country its own coefficient. For this reason, we use broad regional coefficients (e.g., “Asia” or “Eastern Europe”), keeping in mind however that economic differences within a region are huge, and thus the accuracy of the model suffers. To get around this problem, we’ve used publicly available records of per capita GDP of countries and US states. While GDP itself doesn’t translate to salary, it can serve a proxy function for geographic salary variation. Note that we use per capita GDP on the state and country level; therefore the model is likely to produce an inaccurate estimate with GDP figures for smaller geographic units. Two exceptions were made to the GDP data before incorporating it into the model. The per capita GDP of Washington DC is $181K—much greater than in neighboring Virginia ($57K) and Maryland ($60K). Many (if not most) data science jobs in Maryland and Virginia are actually in the greater DC metropolitan area, and the survey data suggest that average data science salaries in these three places are not radically different from each other. Using the true $181K figure would produce gross overestimates for DC salaries, and so the per capita GDP figure for DC was replaced with that of Maryland, $60K. The other exception is California. In all of the salary surveys we have conducted, California has had the highest median salary of any state or country, even though its per capita GDP ($62K) is not ranked so high (nine states have higher per capita GDPs, as do two countries that were represented in the sample, Switzerland and Norway). The anomaly is likely due to the San Francisco Bay Area, where, depending on how the region is defined, per capita GDP is $80K–$90K. As a major tech center, the Bay Area is likely overrepresented in the sample, meaning that the geographic factor attributable to California should be pushed upward; an appropriate compromise was $70K. There is a difference of $10K between the median salaries of men and women. Keeping all other variables constant—same roles, same skills—women make less than men. 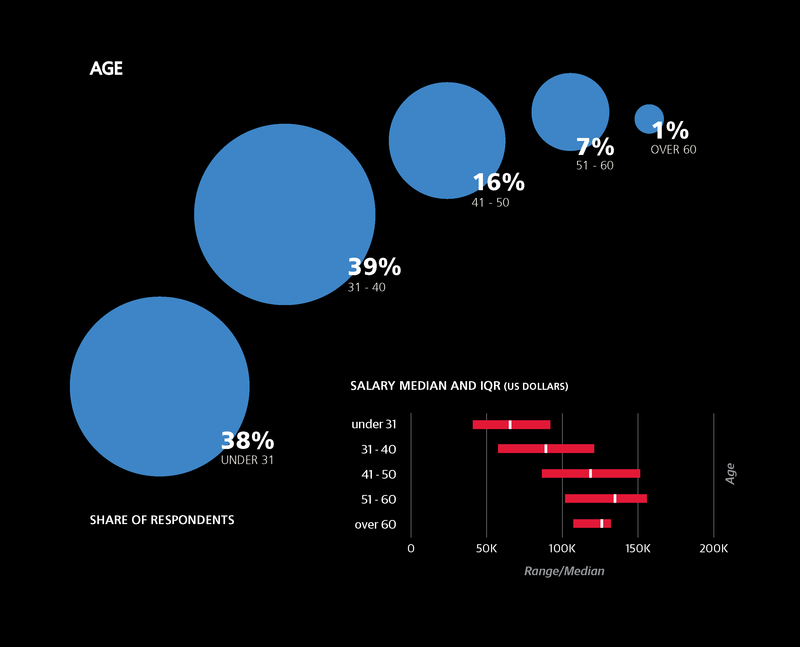 Experience and age are two important variables that influence salary. The coefficient for experience (+3.8) translates to an increase of $2K–$2.5K on average, per year of experience. As for age, the biggest jump is between people in their early and late 20s, but the difference between those aged 31–65 and those over 65 is also significant. 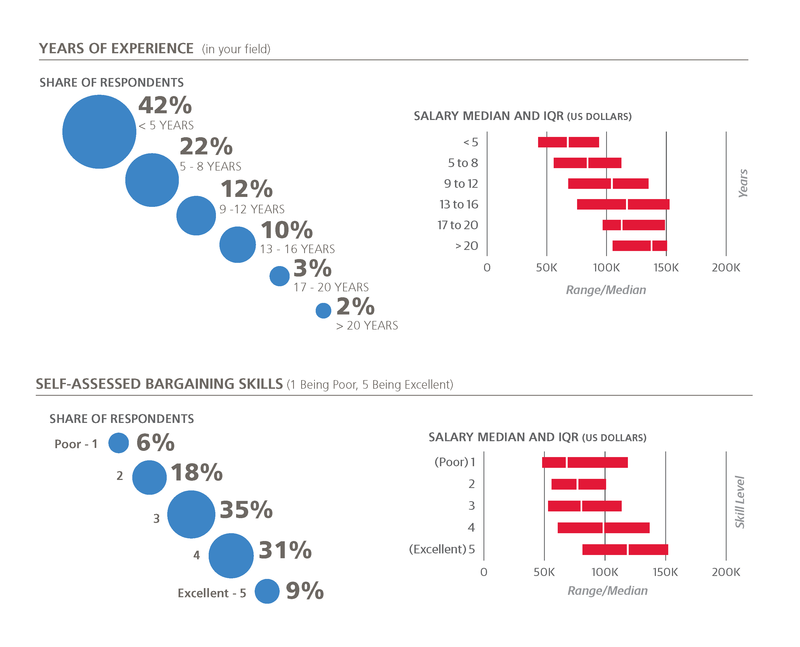 We also asked respondents to rate their bargaining skills on a scale of 1 to 5, and those who gave higher self-evaluations tended to have higher salaries. 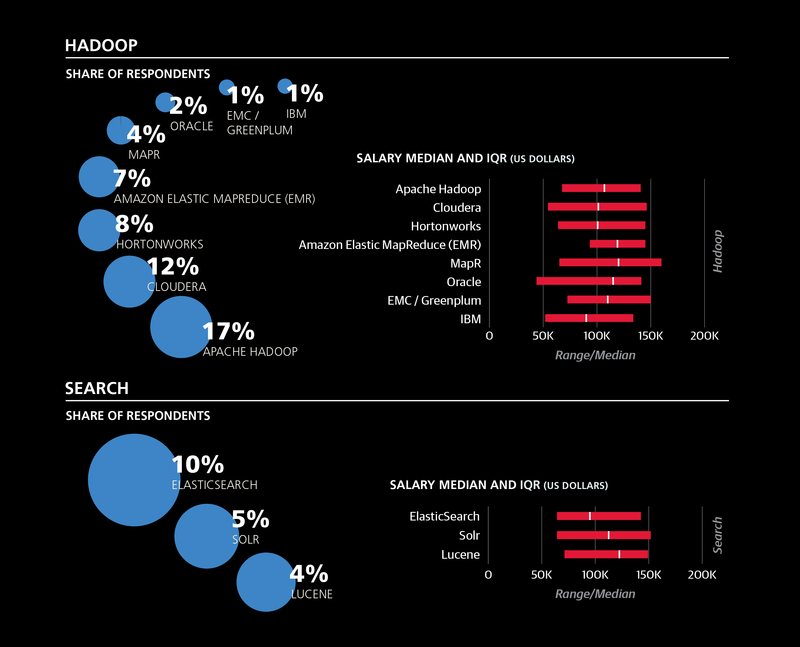 The difference in salary between two data scientists, one with a bargaining skill “1” and the other with “5”, with otherwise identical demographics and skills, is expected to be $10K–$15K. 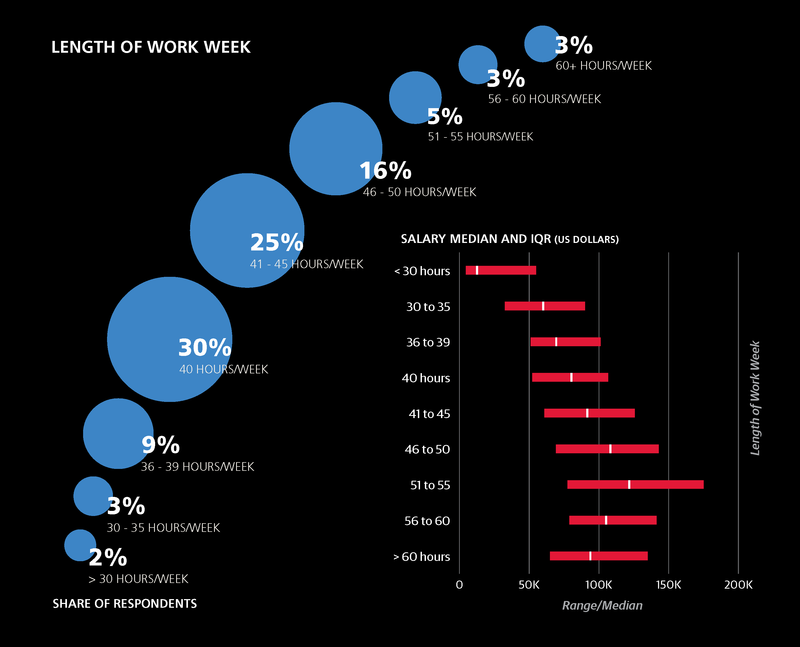 Finally, in terms of work-life balance, our results show that once you are working beyond 60 hours, salary estimates actually go down. For every task, respondents chose from three options: no engagement, minor engagement, or major engagement. The task with the greatest impact on salary (i.e., the greatest coefficient) was developing prototype models. Respondents who indicated major engagement with this task received on average a $7.4K boost, based on our model. Even minor engagement in developing prototype models had a +4.4 coefficient. When both tasks and job titles are included in the training set, job title “wins” as a better predictor of salary. It’s notable however, that titles themselves are not necessarily accurate at describing what people do. For example, even among architects there was only a 70% rate of major engagement in planning large software projects—a task that theoretically defines the role. 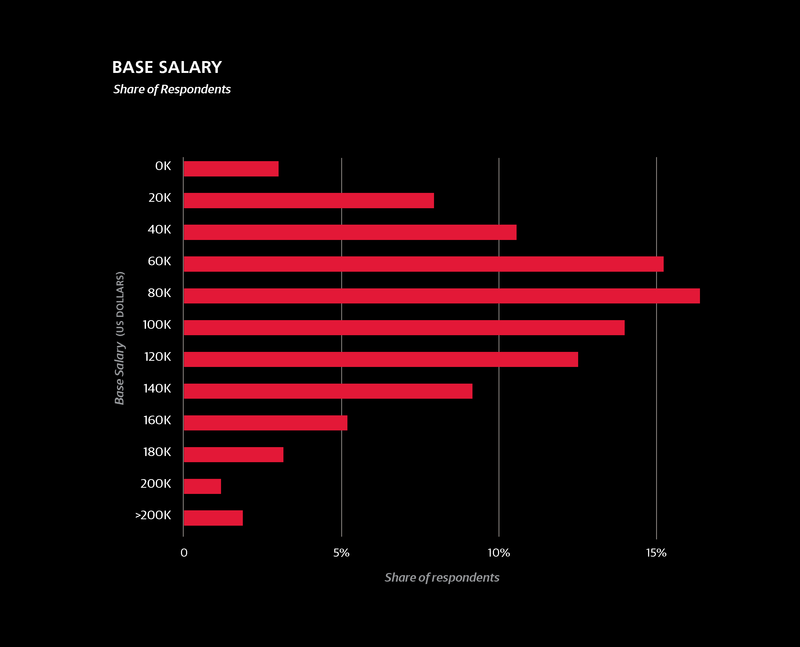 Since job title does perform well as a salary predictor, despite this inconsistency, it may be that “architect,” for example, is a symbol of seniority as much as anything else. Respondents with “upper management” titles—mostly C-level executives at smaller companies, directors and VPs—had a huge coefficient of +20.2. Engagement in tasks associated with managerial roles also had a positive impact on salary, namely: organizing team projects (+9.7), identifying business problems to be solved with analytics (+1.5/+6.7), and communicating with people outside the company (+5.4). 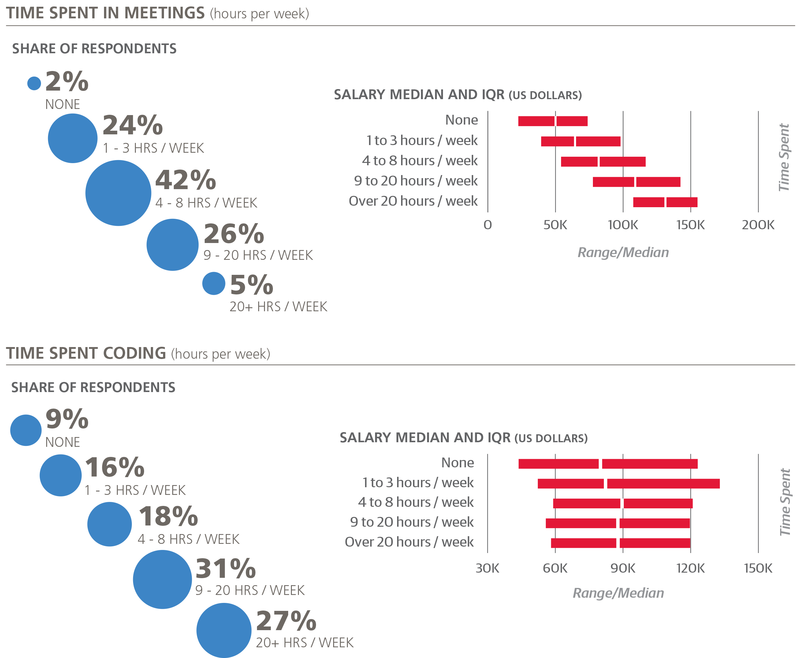 The highest median salaries belong to those who code 4–8 hours per week; the lowest to those who don’t code at all. Notably, only 8% of the sample reported that they don’t code at all, significantly down from last year’s 20%. Coding is clearly an integral part of being a data scientist. 1Of course, we haven’t actually tested this. If you try it out, let us know how it goes. The top two tools in the sample were Excel and SQL, both with use by 69% of the sample, followed by R (57%) and Python (54%). Compared to last year, Excel is up (from 59%), as is R (from 52%), while SQL and Python are only slightly higher than last year. The cluster with the largest coefficient was centered on Spark and Unix, contributing +3.9 per tool. Spark usage was 20%, up from last year’s a modest 3%, and it continues to be used by the more well paid individuals in the sample. In contrast to the largely open source Spark/Unix cluster, the second highest cluster coefficient (+2.4) was assigned to a cluster dominated by proprietary software: Tableau, Teradata, Netezza, Microstrategy, Aster Data, and Jaspersoft. In last year’s report, Teradata also featured as a tool with a large, positive coefficient. The other three clusters with significant coefficients mostly consisted of open source data tools. While the model we’ve explained is a good way to get an estimate for how much someone earns given a certain tool stack, it doesn’t necessarily work as a good guide for which tool to learn next. The real question is whether a tool is useful for getting done what you need to get done. If you never have to analyze more data than can fit into memory on your local machine, you might not get any benefit—much less a salary boost—by using a tool that leverages distributed systems, for example. In the following sequences of tools, the next tool in the sequence was frequently used by respondents who used all earlier tools, and these sequences had the best salary differentials at each step. If you know the first tool in a sequence, you might consider learning the second, and so on. 2Tools are added up to a maximum number. This is because few respondents had more than that number of tools from the cluster, and so if someone uses more, there is no evidence to support continued addition of coefficients. The four clusters were not evenly populated: their shares of the survey sample were 29%, 31%, 23%, and 17%, respectively. They can be described as shown on the right. A selection of tool and task percentages are described in the sections that follow, and the full profiles of tool/task percentages are found in Appendix A: Full Cluster Profiles. For all of the above tasks, the top two percentages were held by clusters 3 or 4 and were both much higher than either percentage for clusters 1 and 2. Survey respondents assigned to clusters 3 and 4 tend to use Python much more than those assigned to 1 and 2, and the relative difference (as a ratio) grows when we look at the two packages: cluster 3 and 4 respondents are 8–10 times as likely to use them as cluster 1 and 2 respondents. Between clusters 3 and 4 there is a difference as well, albeit more minor: cluster 3 has a higher Python usage rate, while a larger share of cluster 4 respondents don’t use Python or these packages. 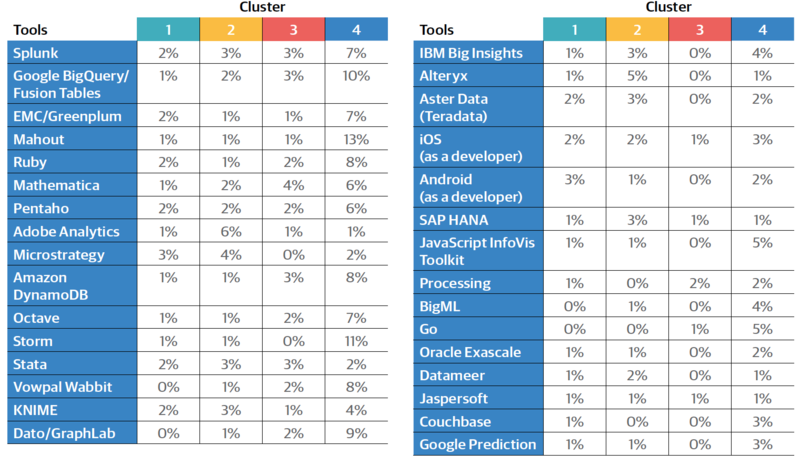 It turns out that these are the only tools whose highest usage rate is among cluster 3 respondents.4 For most other tools that are used much more frequently by clusters 3 and 4 than by 1 and 2, they are also used more frequently by cluster 4 than by cluster 3. Cluster 4, it seems, is much more of an “open source data engineer” descriptor than cluster 3, which heads in that direction but not nearly to the same extent. It’s not rare for cluster 3 respondents to have used these tools—86% of them used at least one—but on average they only used about 2.2. In comparison, respondents in cluster 4 used an average of 5.3 tools. 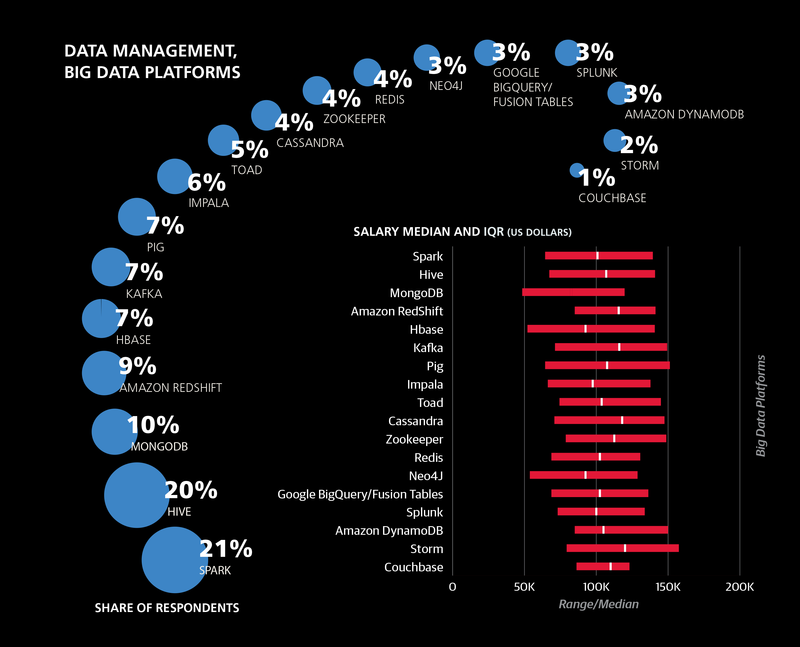 The fact that ETL and data management are much more important in cluster 4 than cluster 3, implies that while both might represent data science, cluster 3 tends toward the analyst’s side of the field, and cluster 4 tends toward the engineering or architecture side. As for the other two clusters, differences between clusters 1 and 2 become apparent once we look at the rest of the aforementioned proprietary tool set. Cluster 2 respondents tended to use these much more frequently. 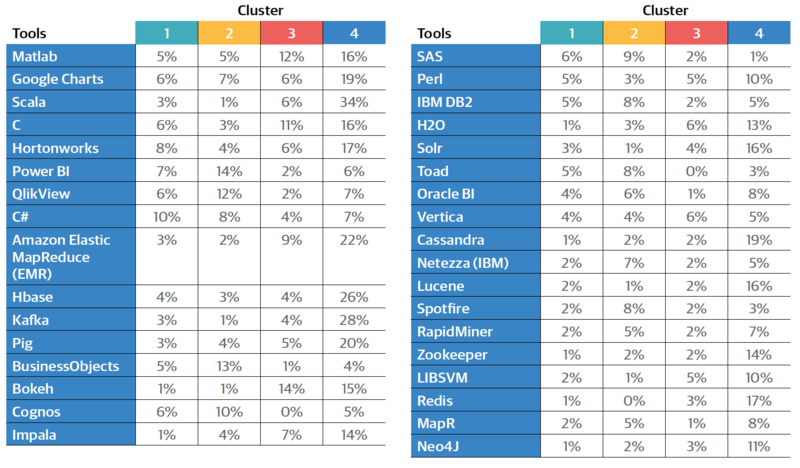 For most of tools shown below, cluster 1 has the second highest usage rate, but they significantly lag behind those of cluster 2. Cluster 1 respondents tended to use fewer tools in general: just under 8 on average, compared to 10, 13, and 21 for the three other clusters, respectively. The first two tasks are functions of an analyst, and are fairly common among cluster 3 and 4 respondents as well. Crucially, none of these tasks depend on being able to code (at least, not as much as the four tasks above that are closely associated with clusters 3 and 4). 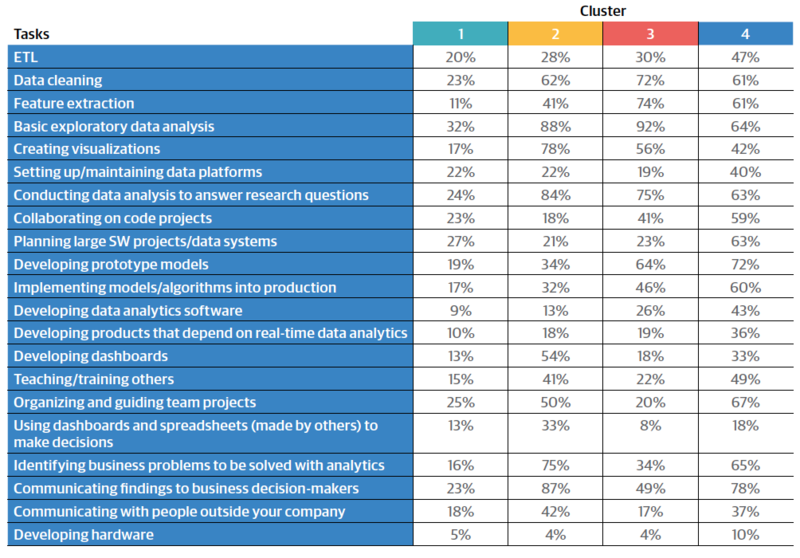 The low percentages for cluster 1 sheds some light on the nature of this cluster: most respondents in the sample whose primary function is not as a data scientist, analyst, or manager seem to be grouped there. This includes programmers who aren’t deep in the space (e.g., Java programmers who only use a few data tools). 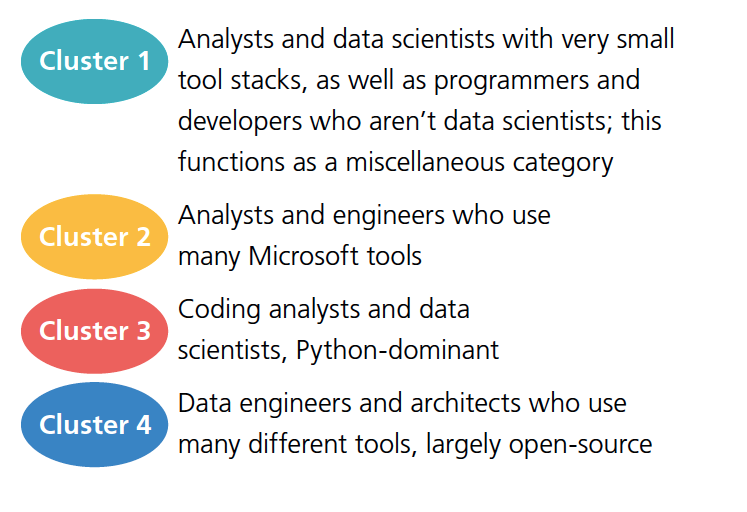 There are analysts and data scientists in cluster 1, but they tend to have small tool sets, and the composite feature of non-participation in many data tasks and non-use of data tools is what binds cluster 1 together. 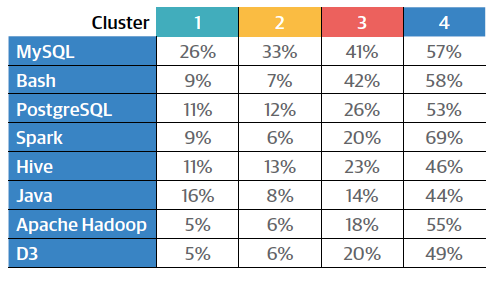 Tableau, Oracle, Teradata, and Oracle BI usage is higher in clusters 2 and 4, lower in clusters 1 and 3. The same is true for SQL, but like Excel and R, it’s exceptional in its wide usage across all four clusters. 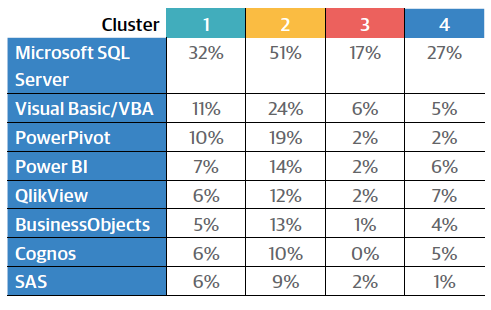 In fact, SQL and Excel are the only two tools (or tasks) that are used by over half of the respondents in each cluster. R is not used as much by cluster 1, but usage among the other three clusters is about the same: 67%– 69%. 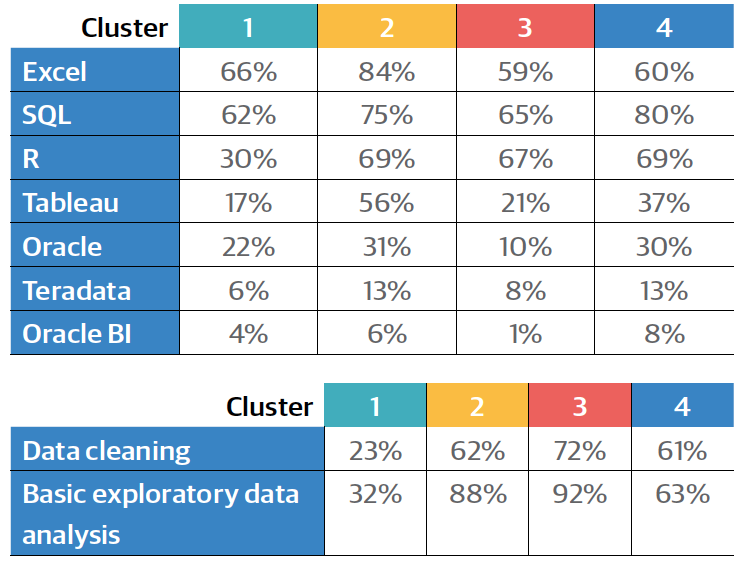 Data cleaning and basic exploratory analysis are similarly high for clusters 2, 3, and 4, and much lower for cluster 1. These tasks and tools cut across the cluster boundaries, and don’t seem to have much correlation with the more salient tool/task differences. Perhaps even more illustrative of the connection between clusters 2 and 4 are the managerial/business strategy tasks. The implication is that respondents in 2/4 tend to be more senior, which turns out to be true, but only to an extent. In terms of years of experience, clusters 1, 2, and 4 are about the same—8–9 years on average—while for the cluster 3, the average is much smaller: only 4.4 years; a similar difference exists for age. Despite representing the least experienced cohort, cluster 3 isn’t the lowest paid; that distinction goes to cluster 1, with a median salary of $72K. At $84K, cluster 3 is still lower than cluster 2 ($88K), but cluster 4 salaries tended to be far higher than either, with a median of $112K. Cluster 4 respondents tend to use a far greater number of tools than respondents in the other clusters, and many of the tools they commonly use are ones that had positive coefficients in the regression model. 3We tried a variety of clustering algorithms with various numbers of clusters, and the two best performing models came from KMeans, with two and four clusters. The partition in the 2-cluster model is more or less preserved in the 4-cluster model, so we will use the latter, keeping in mind that there is a primary split between the first two and last two clusters. 4Excluding tools that didn’t have a significant difference between the top two percentages: Mac OS X, ggplot, Vertica, and Stata. THE REGRESSION MODEL WE USE to predict salary describes relationships between variables, but not where the relationships come from, or whether they are directly causative. For example, someone might work for a company with a colossal budget that can afford high salaries and expensive tools, but this doesn’t mean that their high salary is driven up by their tool choice. Of course, it’s not so simple with salary. When tools become industry standards, employers begin to expect them, and it can hurt your chances of landing a good job if you are missing key tools: it’s in your interest to keep up with new technology. If you apply for a job at a company that is clearly interested in hiring someone who knows a certain tool, and this tool is used by people who earn high salaries, then you have leverage knowing that it will be hard for them to find an alternative hire without paying a premium. This information isn’t just for the employees, either. 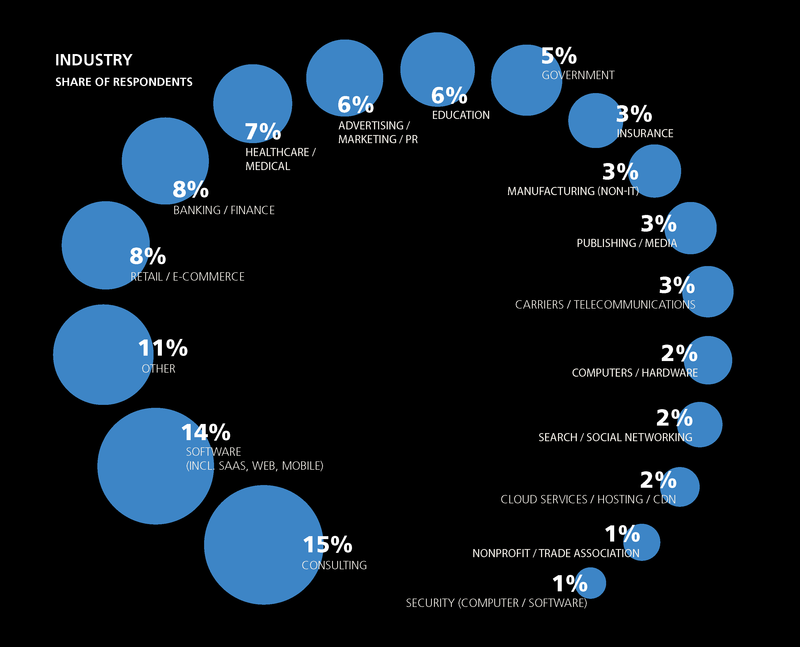 Business leaders choosing technologies need to consider not just the software costs, but labor expenses as well. We hope that the information in this report will aid the task of building estimates for such decisions. If you made use of this report, please consider taking the 2017 survey. Every year we work to build on the last year’s report, and much of the improvement comes from increased sample sizes. This is a joint research effort, and the more interaction we have with you, the deeper we will be able to explore the data science space. Thank you! Article image: The Seven Virtues, by Brueghel, published by Philippe Galle. (source: Wikimedia Commons).